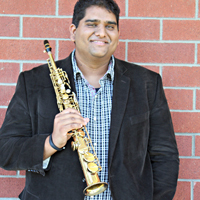 Saxophone alumnus Andrew Harrison (DMA ’15) performed two back-to-back concertos last month at La Sierra University and Cerritos College. On November 10th, Harrison performed the premiere of Jim Stephenson’s Mobius Trip: Concerto for Saxophone and Wind Ensemble at La Sierra University in a concert conducted by alum Giovanni Santos (MM ’07). Three days later, on November 13, Harrison presented Fantasia sur un theme original by Jules Demmersseman with the Cerritos College Wind Ensemble, directed by David Bentancourt.